A snow day on a Saturday…which lets make this clear, all of my snow days are on Saturdays and Sundays. Oh! how I was not aware of my love of snow days when I picked a profession that A) doesn’t recognize snow as a reason to not work and B) a profession that in case of a snow emergency…I am one of the few lucky folks allowed on the roads to go to work…what was I thinking??? And I know, unless you are a teacher … you are in this snow boat with me. I knew I liked snow days, but I was unaware of my deep love and adoration of them until they were abruptly removed from my life. Just the mere possibility of one would be enough to appease me at this point. I imagine a real mid-week snow day as an adult doesn’t vary far beyond that of when I was a teenager…they still require/demand pajamas until well past noon and perhaps even early evening and only after you watch NBC Nightly News with Brian Williams will you even consider a shower and fresh pajama bottoms (Disclaimer: I loved Brian Williams even when I was 15). A day where the TV possibilities are endless and guilt free…Bravo for breakfast, Netflix for lunch, and Dirty Dancing for mid-afternoon snack. And if something needs to be scheduled than let it be a nap… Oh naps…don’t even get me started on the lack of naps in my life. If I remember right, meals have no real structure on snow days…it is all about grazing and creating from tidbits gathered from within your overly stocked kitchen, because well…if you are me and have a food blog, then you generally can whip up a 5 course meal (or hot fudge and caramel for the vanilla ice cream in your freezer) without needing a trip to the grocery. 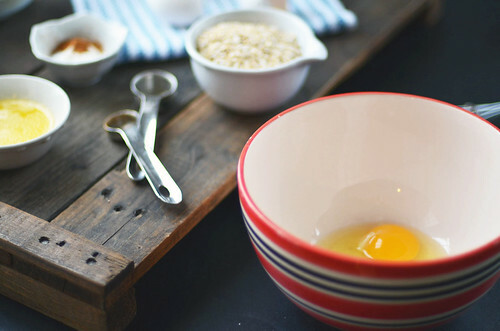 I was cracking eggs and whisking together flour and baking soda, making pancakes and chocolate chip cookies for my brothers and I on the numerous snow days we spent growing up together ….with only one bit of advise from my parents – don’t burn down the house. That rule still stands. I was made for enjoying snow days…Snow days are wasted on people like my brothers, both amazeball teachers, but who have no desire/need/want to whip something up besides pizza rolls as they play Call of Duty with 12 year olds on their numerous snow days each year. I might be a bit bitter. Because I am at work and they are still in their pajamas – however, when I talk to them later they will proclaim that they were productive about the house. HA! They may be able to fool my mother and perhaps their wives, but not me. I know my brothers…they played Call of Duty all. day. long. And tried this…which I can prove by a slew of text messages all day long about the breakneck speed at which they were running miles (they got sub 7 minute miles under the belts)…trying to beat eachother by mere seconds. I am awaiting pictures of treadmill face burns. Any who…a snow day, be it a Wednesday or a Saturday, is just so darn delightful. An excuse not to leave the house, which if you are a hermit like myself, this is a godsend…several inches of snow gives you ample reason to stay cooped up inside all day – the roads are treacherous, the air too cold for my sensitive lungs, my feet will become frozen and I will undoubtedly lose a toe…all feasible and believable reasons to remain at home…I might need to explain some day my absolute love of being at home but also my wanderlust that creeps up and unsettles my very being…it is a constant struggle and something for another time. But for now just know…cold and snowy = Mallory is not leaving her house unless it is Monday through Friday in which I will venture out for 8 hours, just to return home and hibernate until the following morning. I am a ball of fun in the winter. This past Saturday, with no true plans because of a forecast full of snow, temperatures well below freezing, and whipping winds…I rose early from bed, started the coffee, put on some tunes, and put the butter in the freezer. I had pie on the brain from the get go. 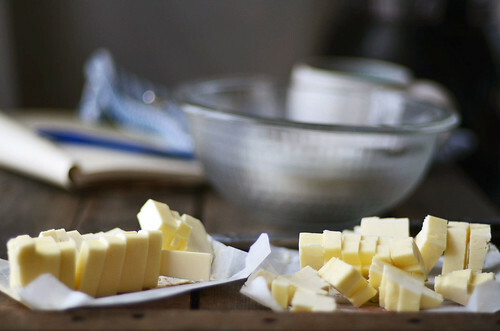 All butter crust…which calls for lots of butter. 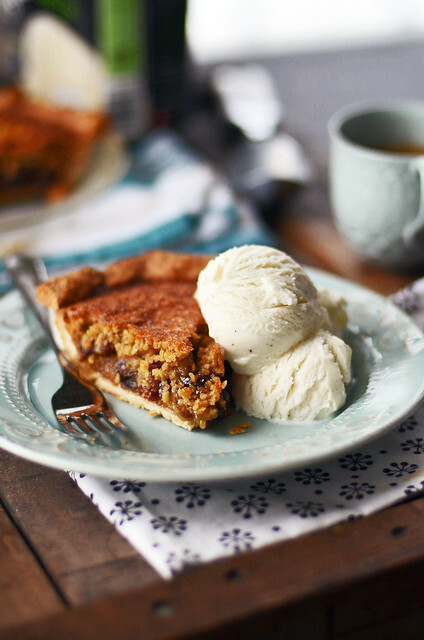 This pie only needs one crust, but this recipe will make you two…because there are worst things than having an extra disk of pie dough in your fridge. Keep your butter cold. I like to stick mine in the freezer for about 15 minutes before I start cutting into the flour. Gives me time to drink another cup of coffee. 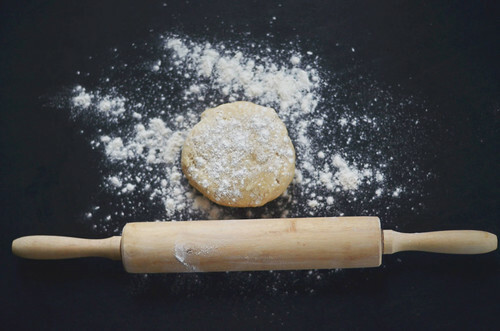 Flour, salt, and a touch of sugar are whisked together (or pulsed a few times in a food processor) depending on your method for pie crust creation. Disk of dough. Dough disks. 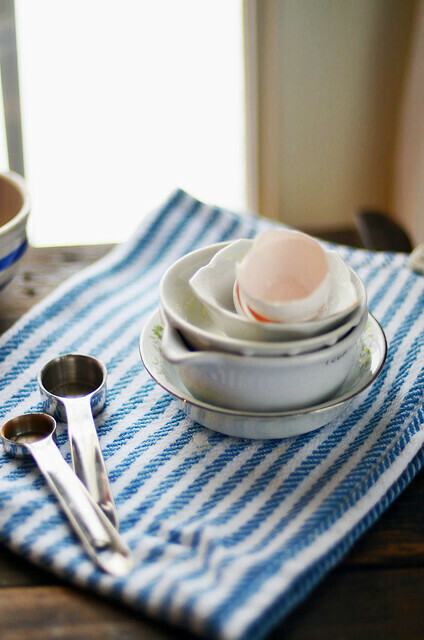 When this happens … talk about feeling like kitchen Queen. Queen of the kitchen. Then you dribble coffee down the front of your pajamas and well, back to being peasant of the kitchen. Kitchen Peasant….with coffee on your socks. 27 minutes later and a few pounds of dried pinto beans later…. 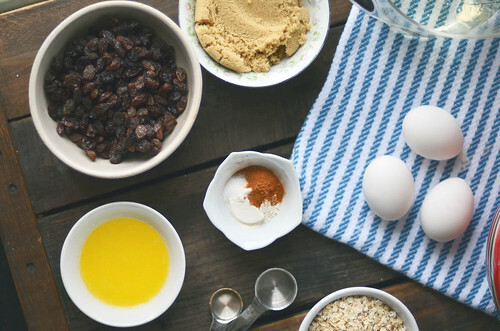 Wrangle together raisins, flour, cinnamon, salt, melted butter, brown sugar, eggs, corn syrup, and quick oats. Staple items, people…nothing complicated needed. Whisk together eggs, corn syrup, brown sugar, and melted butter. Next goes in the raisins, oats, flour, cinnamon, and a touch of salt…. 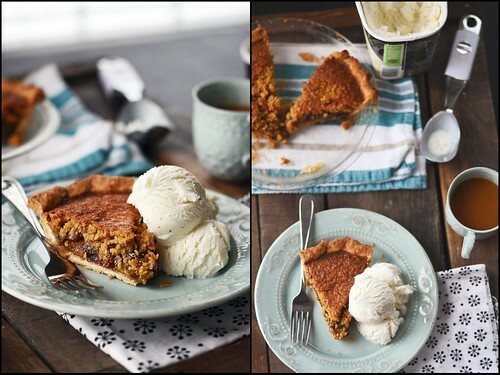 This is a top 5 pie in my world and with 8 slices – think of the ice cream variations that could be had. Vanilla, butter pecan, maple something or other, rum raisin, whiskey and pecans, coffee? peanut butter? 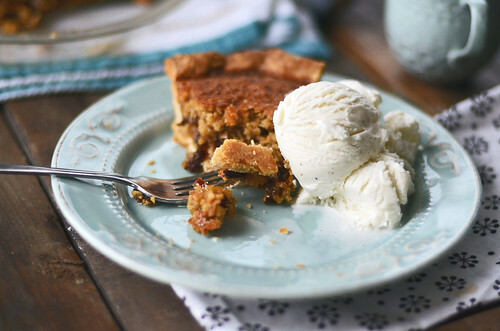 But trust me, you don’t need ice cream to enjoy this pie…it is delightful standing in your kitchen eating it like a slice of pizza careful not to drop any of the flaky buttery crust on the floor, because that would be disastrous. 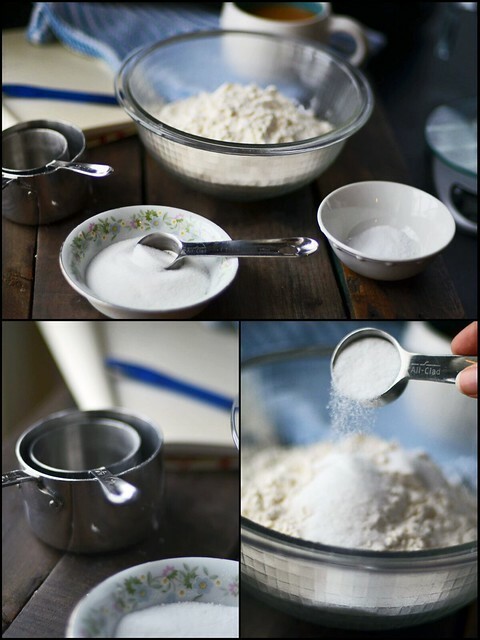 Combine flour, salt, and sugar in a food processor and pulse a few times to combine. Add cold diced butter and pulse until butter is pea sized. ( This can also be done by hand or with a pastry cutter.) With food processor on low, slowly add cold water just until a dough begins to come together and form a ball. Empty dough out onto a lightly floured surface - dough should be shaggy and not wet by any means. 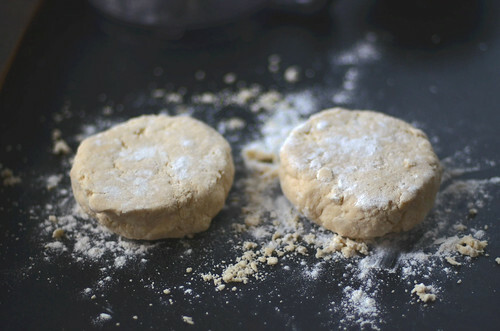 Divide dough into 2 balls and flatten slightly into disks. Wrap with plastic wrap and refrigerate for at least one hour. You will only need one dough disk for pie. 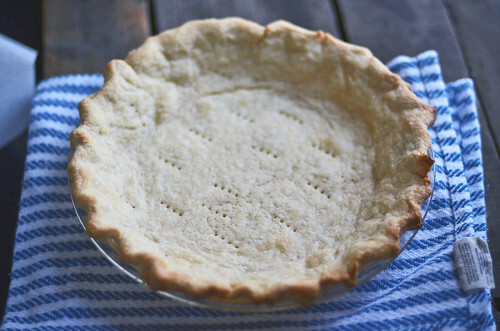 After one hour, remove pie dough from fridge and on a lightly floured surface, roll dough out to a ⅛th inch thickness, about 12 inches in diameter, which will fit a 9 inch pie plate with a little bit hanging over the edges of pie plate. 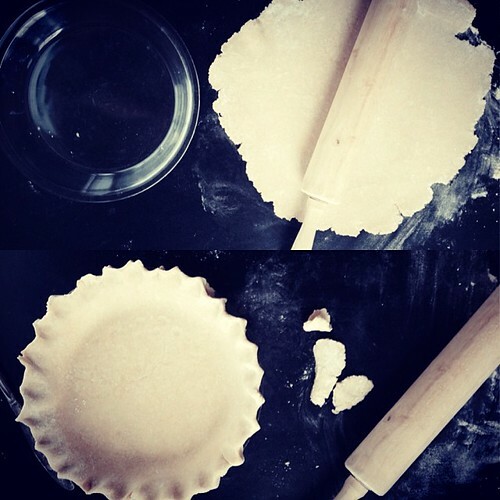 Transfer dough to pie plate and without stretching dough, tuck the dough to fit the pie plate. Trim off any excess dough around edges and then with thumb and forefinger, crimp edges. 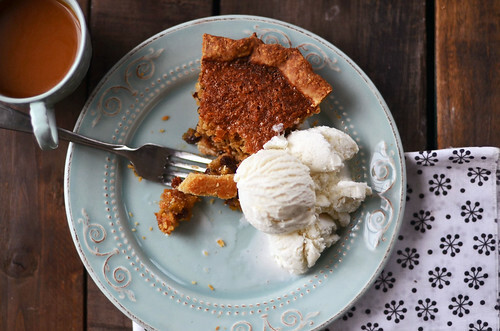 Place pie shell in freezer for 15 minutes. Remove from freezer and with a piece of tinfoil, line pie shell - tucking it along the bottom edge and sides. Let the excess tinfoil hang over the edges. Fill tinfoil lined pie shell with enough dried beans to fill pie plate. Place in preheated oven and let bake for 15 minutes. Prick the bottom of the pie shell about 8 to 10 times with the tines of a fork and the edges of the pie in a few spots. Reduce oven temperature to 375F and let bake for an additional 12 minutes. Remove from oven and let cool while you prepare the filling. 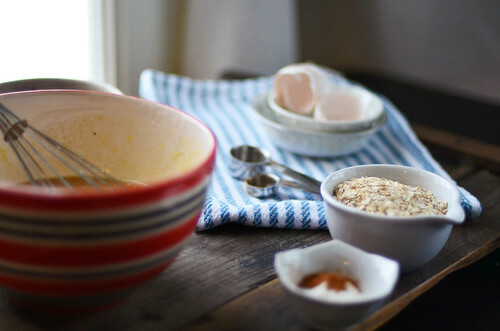 In a large mixing bowl, whisk together eggs, corn syrup, brown sugar, and melted butter. 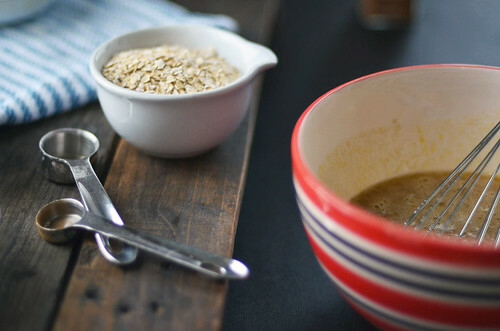 Stir in oats, raisins, flour, cinnamon, and salt and mix until combined. 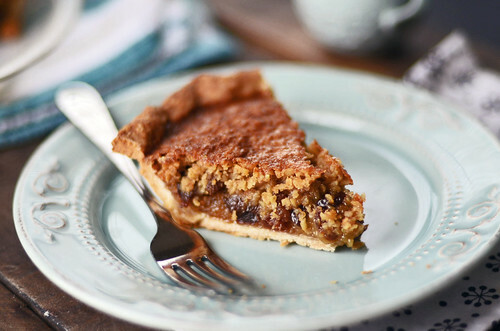 Pour filling into a cooled (at least somewhat) pie shell and with a fork, gently move raisins about to ensure even distribution. Place pie on a baking sheet and place in center of preheated oven. Remove from oven and let cool completely before cutting and serving. 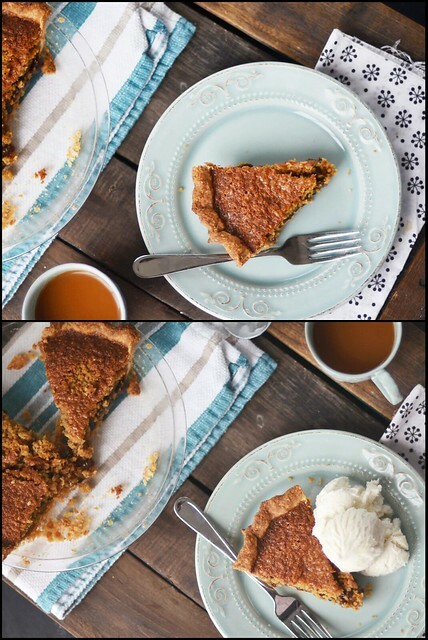 This pie crust recipe will make 2 crusts, however you will only need one…but since it is as easy to make 2 as it is 1, I always make two crusts. Wrap and keep other crust in fridge for perhaps another pie in the coming week or wrap well and store in freezer and when in need of pie in the next month or so, you are ready to roll.